The tone inside the conference center at the U.N. Climate Negotiations in Cancun has been a bit dismal this past week. Yet despite the reduced expectations inside, this morning the international peasant movement La Via Campesina gave us a new injection of hope and vision with a vibrant march of thousands of small farmers, Indigenous peoples and community activists through the streets in Mexico. It kicked off today's international day of action – "1,000 Cancuns" – where grassroots organizations across the world demonstrated local resiliency and real solutions to the climate crisis. 30 coordinated events took place in the U.S. and Canada today, anchored by the Grassroots Global Justice Alliance. Here in San Francisco, more than a dozen local community organizations joined forces to help convert a Mission District parking lot into a community garden and park with affordable housing units. Click here for photos. 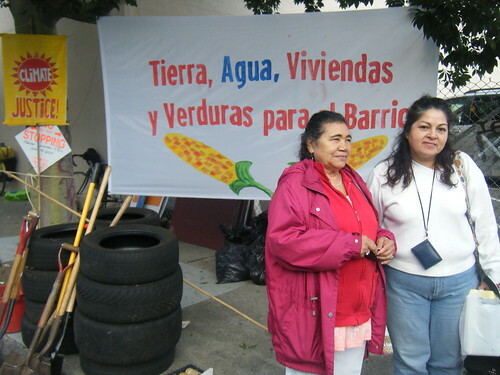 "This action demonstrates a tangible solution to the climate crisis by promoting local food production, challenging our dependence on automobiles and strengthening bonds within the community," explained Teresa Almaguer of People Organizing to Demand Environmental & Economic Rights (PODER) "The climate crisis requires community-based solutions and an end to corporate influence within the UN climate negotiations." In addition to planting vegetables, participants enjoyed live music, theatrical performances and speakers all focusing on solutions to the climate crisis. A common theme at the event was increasing local food production in the fight against climate change, in contrast to the corporate-driven false solutions being put forth inside the U.N. negotiations. "Industrial agriculture is one of the top three sources of greenhouse gas emissions," said Michelle Mascarenhas-Swan of Movement Generation. "Agribusiness corporations profit from everything from fertilizer and pesticide sales to control of what goes onto supermarket shelves. The people are left paying the true costs in polluted water, depleted soil, diet-related diseases, and climate disruption. Meanwhile, U.S. agribusiness harms small farmers, farm workers and consumers – in the U.S. and around the world." The Mission District parking lot at 17th and Folsom streets has been the target of an ongoing campaign by community organizations to legally reclaim publicly-owned land to meet community needs. Similar efforts have been successful in other parts of San Francisco and the Bay Area largely for the creation of community gardens. 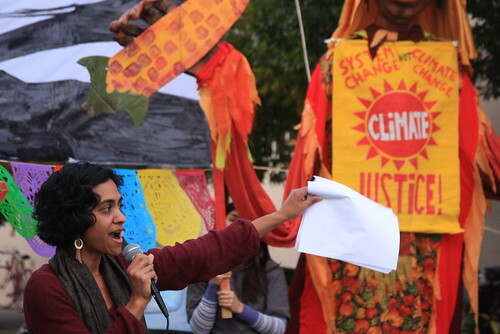 "At the UN Climate negotiations, the US government – highly influenced by corporate polluters – has pushed for an accord that would lock us in to catastrophic impacts from disrupting the earth's climate systems," explained Xochitl Bernadette Moreno of People Organized to Win Employment Rights (POWER). "The Obama Administration needs to drop the Copenhagen Accord and uphold the Cochabamba Agreement which the world's people's movements have put forth as a real solution to solving the climate crisis." Click here to sign a message to Obama to stop obstructing a real climate deal in Cancun! Event cosponsors included: Asian Pacific Environmental Network, Center for Political Education, Communities for a Better Environment, Global Alliance for Incinerator Alternatives, Grassroots Global Justice Alliance, Mobilization for Climate Justice West, Movement Generation Justice and Ecology Project, Mujeres Unidas y Activas, People Organizing to Demand Environmental & Economic Rights (PODER), People Organized to Win Employment Rights (POWER), Richmond Progressive Alliance, Urban Tilth, West County Toxics Coalition.